If you are not telling your story, who is? Consumers often regard advertising with skepticism, but if they read a similar message in a newspaper or magazine article, then they seek out information - which can have a positive impact on your bottom line, on attendance at your event ,or on your social or political cause. The proof? Public relations generates 28% of sales inquiries, according to a consumer and business purchasing pattern study by Inquiry Handling Services. However, many organizations neglect this cost-effective marketing tool. When it comes to writing effective media releases, you need to know what makes the media tick. The Third Edition of How To Write Media Releases includes more examples of media releases and media advisories and more exercises to help your organize and write your media releases. 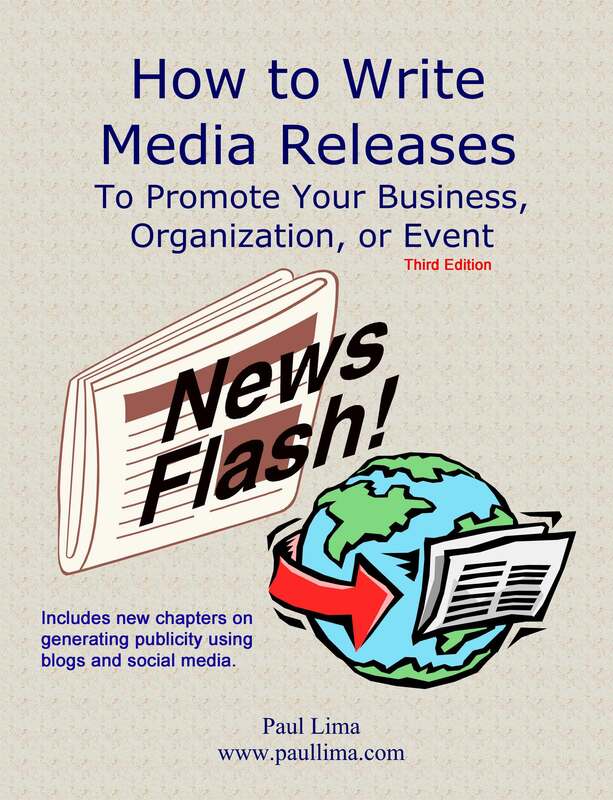 In addition, the book includes two new chapters on generating publicity using blogs and social media such as LinkedIn, Facebook and Twitter. “I fired off a Media Release and it resulted in an interview and TV spot the very next day. My clients and I are thrilled with the early success." "Paul Lima delivers the goods... His information was exactly what our members are looking for. His material was fresh and timely." If you want to write and issue media release, then this is is the place to start!